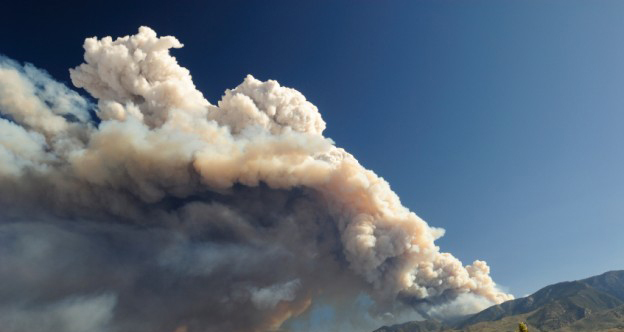 Fire is fire – and it needs to be extinguished to preserve the safety of the environment. Did you know, however, that there are at least five different types of fires? These classes of fires require specific handling to squash the flames. We’ll discuss the various kinds of fires that pop up and how to precisely put them out. Fires are classed into certain categories and are based on the fire’s fuel source. Keep your home or business safe by keeping on hand the right types of equipment that are designed to put out specific types of fires. The first type of fire is the class A fire. This type of fire ignites from common fuel sources, like wood, trash, fabric, paper and plastics. Class A flames burst out accidentally. Trash and dumpster fires are prime examples of Class A fires. It is noteworthy to mention that dumpster and trash fires do not pose as a hazard to anyone, except those trying to extinguish the flames. In a trash fire, valuables do not exist. As human life is the one element at risk, those attempting to put out the fire should take extreme precaution to protect themselves. Extinguish a Class A fire with water or monoammonium phosphate. Stream a continuous supply of water from the hose to put out the fire. Do not enter the dumpster, as the contents within are unknown. Combustible and hazardous materials may explode at any given time. If you detect or suspect the presence of hazardous materials within the trash, contact your local environmental specialist right away. Class B fires are known to result from an explosion of flammable liquids or gases. Flammable liquids include petroleum-based oils or paint, tars, alcohol, oils, solvents, gasoline and kerosene. Flammable gases include butane and propane. Industries that frequently deal with flammable liquids and gases should take extra precaution to ensure the fluids, lubricants and paints they work with on a daily basis do not combust. When a Class B fire sparks, extinguish it by smothering the flames. Oppressing the fire eliminates the oxygen feeding the flames, and, thereby, deadens the fire. Dry chemicals, like ammonium phosphate or pressurized carbon dioxide are effective means to extinguish a Class B fire. Never attempt to extinguish a Class B fire with water. Splashing water on a fire fueled by flammable liquids only splatters and spreads the flames, increasing the fire’s latitude. Electrical fires are known as Class C fires. Flames in Class C fires erupt due to electrical components, like electrical transformers, appliances and motors. The US Fire Administration reports that over 20,000 electrical fires occur each year. Industries that work with large-scale electrical power equipment may see Class C fires more frequently. Faulty wiring or an overburdened surge protector can spark a Class C fire in smaller businesses too. Homeowners should be careful, as well, since Class C fires can start from space heaters, faulty wiring inside the home, outdated appliances and lights. 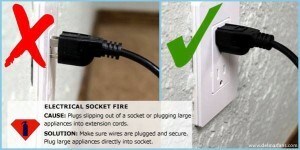 Extinguish a Class C fire by shutting off the electrical power, which serves as the fuel source for the electrical fire. Non-conductive chemicals like carbon dioxide should also be used to suppress the flames. Fires sparked by combustible metals are known as Class D fires. Titanium, magnesium, sodium, lithium, aluminum and potassium are examples of combustible metals. Laboratories are often typical environments where Class D fires occur. Water should never be used to put out a Class D fire. The liquid only worsens the flames fueled by metal fires, since water burns when it comes into contact with specific metals. Dry power agents are advised as ideal extinguishers. Graphite powder, powdered copper and sodium chloride are recognized as effective dry powder agents. The heat absorption and the smothering effects of dry powder agents are suitable to extinguish a Class D fire. Be aware that dry powder agents are entirely different from dry chemical agents. The latter should never be used to put out a flame, as it might intensify the fire. Dry powder should always be used to extinguish a Class D fire. Cooking fires that spark from grease, lard, olive oil, butter, animal fats and vegetable fats are recognized as Class K fires. Commercial buildings and restaurants built with kitchens should be alert to the possibility of Class K fires. Residential homes should also be aware that a Class K fire can spark on the stovetop, oven or grill, especially if grease splatters upon the heat source. Overheated foods in the microwave can also start a cooking fire. Fire extinguishers contain chemical agents that absorb the flames’ heat, cuts oxygen to the fire and effectively smothers the fire. 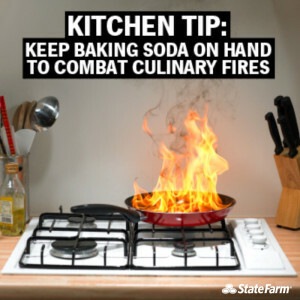 Homes and restaurants should be equipped with fire extinguishers; and, all those working in the kitchen should learn how to use the fire extinguisher. 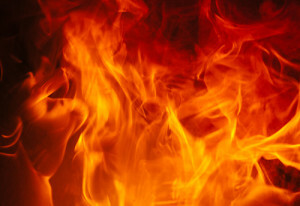 When fire and smoke overwhelm any part of your home or business, contact your local fire damage restoration experts. 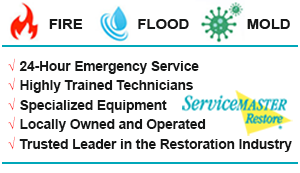 ServiceMaster DRR is equipped with advanced equipment and the latest techniques in fire damage restoration and cleanup services. When the smoke lingers and the soot stains your property, ServiceMaster DRR technicians are a call away. Our licensed and insured fire damage restoration specialists will arrive onsite to conduct an assessment of the destruction caused by fire and smoke and implement an effective plan to restore the property to its pre-damaged condition. 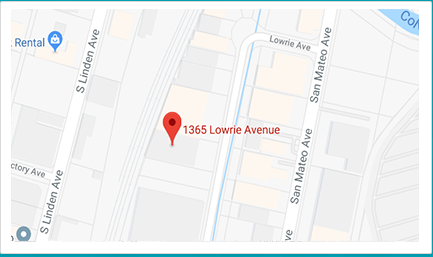 ServiceMaster DRR reliably serves the San Francisco, CA community of residential homes and businesses 24 hours a day, 7 days a week. When any type of fire sparks, don’t hesitate to contact the area’s most trusted and responsive fire damage restoration professionals, ServiceMaster DRR, for a thorough cleanup and a full restoration of your property.